Setup is easy. Insert batteries into the big button pad, and then connect the game pad to the Xbox 360 console. Insert two new alkaline AA (LR6) batteries. For best performance, avoid using AA rechargeable batteries. Up to four big button pads can be connected to a console at the same time. The first player is green. The second player is red. The third player is blue. The fourth player is yellow. Note When the infrared receiver is connected to the console, the lights around the console's power button will illuminate green. Connecting the receiver doesn't affect the connection of other wireless controllers. Point the big button pad at the infrared receiver, and then press and hold the Xbox Guide button or the Start button. The receiver will connect to each big button pad that the receiver detects. Point the big button pad at the infrared receiver, and then press and hold the Xbox Guide button for three seconds. The big button pad continues to work the next time that you turn on the console as long as the infrared receiver cable is still connected. The big button pad works only within 25 feet of the console. Objects that block the line of sight between the game pad and the infrared receiver interfere with the normal operation of the big button pad. The big button works as a directional pad. Use this button and the A , B , X , Y , Back, Xbox Guide , and Start buttons to move around and control the Xbox Dashboard. The big button pad doesn't interfere with other wired or wireless controllers. You can use the big button pad together with other connected wired or wireless controllers for team gameplay. For example, if you have a wireless controller assigned to section 1 on the power button, both the wireless controller and the green big button pad affect the green player in the game. Similarly, the second wired or wireless controller corresponds to red, the third corresponds to blue, and the fourth corresponds to yellow. Clean by using a dry cloth or a slightly damp cloth. Using cleaning solutions or trying to clean connectors might damage your controller. Important The Xbox 360 Big Button Pad controller is for use only with an Xbox 360 console that has an Xbox 360 Big Button Infrared Receiver attached. Make sure the console is turned on. If the console is on, the light in the center of the power button will be green. 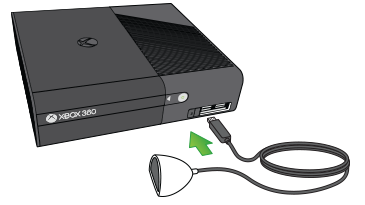 Make sure the infrared receiver cable is plugged securely into one of the USB ports on the Xbox 360 console. Connect the infrared receiver to a different USB port on the Xbox 360 console. 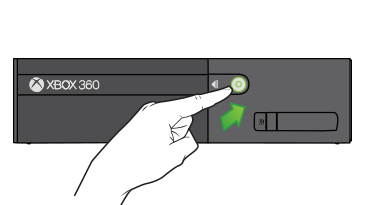 Make sure the AA batteries in the Xbox 360 Big Button Pad are fully charged and inserted correctly. If the Xbox 360 console power cord is plugged into a surge protector or extension cord, try plugging the power cord directly into an electrical wall socket. If the console isn’t connected directly to an electrical outlet, the USB ports might not get enough power. Point the controller directly at the infrared receiver. Make sure that the infrared receiver isn't covered and that there are no objects between the controller and the infrared receiver. Make sure that you're using the controller within 25 feet of the infrared receiver. Close window drapes and blinds when you use the controller and the infrared receiver during daylight hours to minimize the amount of light that is hitting the receiver. Important Do not try to take apart, service, or modify the Xbox 360 console, the power supply, or Xbox accessories in any way. Doing these things could present the risk of serious injury or death from electric shock or fire, and such actions will void your warranty. If the solutions above didn’t resolve the problem, your console needs to be repaired. See Getting your Xbox console or Kinect sensor serviced. Would you like to contact Support regarding the "Set up, use, and troubleshoot the Xbox 360 Big Button Pad controller" issue you were reading about or a different issue?